190 years ago this past week, on November 12, 1827, a group of men gathered in a school room in Albany’s South End, organized a new Episcopal congregation to be named “St. Paul’s Church or Congregation in the City of Albany” and elected the congregation’s first vestry. A week later, on November 19, the vestry elected St. Paul’s first rector, Richard Bury. The new congregation had been meeting in that room since the previous summer, gathered there by the Rev. Mr. Bury (previously priest-in-charge at Christ Church, Duanesburg) and two of his friends, Charles Skerritt and John Le Breton. 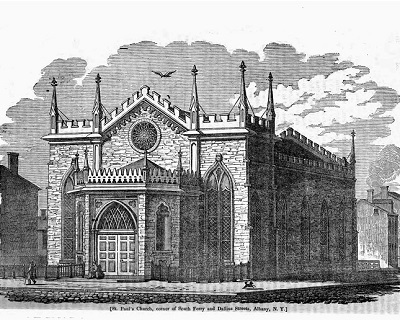 The wardens and vestry of this congregation intend, as soon as sufficient funds shall have been raised, to erect a church in the south part of this city, for the accommodation of its numerous and increasing population; until which time the services of the church will be conducted in a large and commodious room, to be prepared for this special purpose. They will indulge the hope that in this undertaking, they will be favored with the approbation of their fellow-citizens in general; but particularly with the good will and earnest prayers of those, who having “tasted that the Lord is gracious,” are desirous that others also may be brought to a knowledge of “the truth as it is in Jesus,” and to a participation of the blessedness of those who know the Lord, whom to know is life everlasting. Since that beginning, St. Paul’s has owned four buildings in the city, and worshiped in two others (St. Peter’s Church in 1839, and Trinity Church 1964-1966), but this building, where we only stayed from summer 1827 until summer 1829, holds a special place as the congregation’s birthplace. There is some confusion, however, about what sort of school room this was, where it was located and who owned the building. Many of our sources describe their meeting place as a “school room” on South Ferry Street but are vague on its exact location. One says that it was “below Ferry,” and two specifically place it at the corner of South Pearl and Rensselaer Streets. One also mentions that the school room was in the upper room of the building. Is this a literal description, or just a reference to the apostles meeting in an upper room In Acts 1:13? When you think of that school room, don’t picture a cute little red school house, because this seems to have been a very simple old building. In 1827, the city of Albany had no public schools. The first building built as a school in the city (other than the Lancaster School on Eagle Street) was not erected until 1832. This must have been a private school of some kind, using whatever sort of structure was available. Albany Tax Assessments are available for these years, and they list 158 South Pearl, on the northeast corner of Rensselaer, on the rolls for 1827, 1828 and 1830. In 1827, it was described as “old wood building.” In 1828, when St. Paul’s was using it, it is noted: “at present a place of worship.” In 1830, after St. Paul’s had moved into its new building on Ferry Street, it had reverted to use as a schoolhouse. Throughout this period, the building was owned by George Charles, who lived next door. We assume that he plied his trade there, and even with the windows closed against the November chill, the odor of his tannery must have been strong in that school room. There seems, then, to be no doubt that the building in which St. Paul’s was organized was owned by George Charles. But an early (and otherwise very reliable source) tells a different story. The first named committee [authorized “to obtain a room for the temporary use of the congregation”: Bristol Fox, John Nelligar and either Agur or Hezekiah Wells] reported on the following week that Mr. McDougal, the owner of the school house which they then occupied, had offered to repair the building, and put it in a condition suitable for worship for the sum of $230 in advance and $50 annually thereafter, while they continued to occupy it. This offer did not seem to meet with much favor, as they rejected it, and authorized the last named committee [authorized “to secure a lot for erection of a church”: Edward A. Le Breton, Barent P. Staats and Bristol Fox] to treat with Stephen Lush and Mr. Kenyon for the purchase of lots facing on Ferry Street, and finally succeeded in purchasing three lots – two from the former for the sum of $2,500 and one from the latter for the sum of $500, in the following spring. This Mr. McDougal must be John W. McDougal who was also a member of St. Paul’s first vestry. It would certainly make sense that the congregation would use a building owned by one of the organizers. If McDougal did own the building, and was, as the article claims, rejected in his offer of a long-term lease of the building, this might explain why, after this mention, he disappears completely from church records. So, while can be certain about the school room’s location, we are left with a mystery concerning it’s ownership. The Albany Evening Journal account has the ring of truth, and may help us understand why Mr. McDougal left the church immediately after it was formed. But the tax assessments are very strong evidence that the old wood buidling was owned by George Charles. This entry was posted in Clergy on November 19, 2017 by Paul Nance. It is Veterans’ Day again, and time to remember those of the St. Paul’s family who served in the military. We have mentioned veterans of two twentieth century wars. A year ago, we celebrated our one-time organist and choirmaster, T.F.H. Candlyn, who served in World War I. And we have mentioned those from St. Paul’s who died while fighting in the Second World War. Today, we reach back into the preceding century, to a man who fought with the United States army in two wars. But there are other reasons to remember this man, who contributed significantly to Albany’s entertainment and musical life in the middle third of the nineteenth century. John Cooke was born in England about 1797. He came to the United States in 1820 as part of the circus band with the Page, Austin and Tufts Menagerie. By 1825, he was in Providence, Rhode Island, where he formed his first band. Shortly afterward, he moved to Albany, where his first job was again as a band musician, with a circus situated on North Pearl Street, now the site of the Capital Repertory Theater. Settled in Albany by 1830, John Cooke quickly established two institutions that formed an important part of the city’s entertainment: the Albany Brass Band and Castle Garden. The Albany Brass Band (often referred to as Cooke’s Brass Band), was Albany first wind band, and during the antebellum period the only source of popular wind music here. Between 1830 and 1861, the band played at many public events, and sponsored concerts, military events, dances, cotillions and balls. The band was also associated with Albany’s Republican Artillery. The band drilled with the soldiers, and accompanied them on a formal visit to New York City. Neither the brass band nor Castle Garden produced much income. But their popularity, and the personal affection felt for Cooke, can be gauged by the numerous benefits for him, each attempting to cover the losses of the season. Cooke volunteered for the army during the Mexican War of 1846-1848. He was appointed a First Lieutenant in the 2nd Regiment of the First New York Volunteers. Cooke ended that conflict as a captain of artillery, and used that title for the rest of his life. During the 1850s, Cooke’s Brass Band continued its busy schedule of balls and cotillions. Castle Garden had closed as a pleasure garden in 1845, but for much of this period Cooke continued a smaller business as a bowling saloon at the same address. “Saloon” should not be understand to mean Captain Cooke was serving alcohol: advertisements make it clear that this was a soda parlor, serving ice cream during the summer months to quench the thirst of the bowlers. With the advent of the Civil War in 1861, John Cooke joined those responding to President Lincoln’s call for 75,000 volunteers. When that three month enlistment expired, Cooke, now 64 years old, volunteered as a captain in Company F of New York’s 91st Infantry Regiment. Two years later, in May 1863, while leading his men on an assault of a Confederate battery, Captain Cooke was injured at the siege of Port Hudson, Louisiana. A bullet struck his right shoulder and lodged against the bone, shattering the arm. Cooke was evacuated to St. James Hospital in New Orleans, where he spent 44 days. He was mustered out on June 22, 1863 and by August of that year had returned aboard ship to New York City, on his way home to Albany. Captain Cooke wanted to return to military service, but his health would not allow it, nor it seems was he able to return to work with his band or his saloon. In 1867, a newspaper reported that he was “in the most indigent circumstances.” It had been hoped that the Constitutional Convention of 1867 might award him a pension, but that did not happen. Instead, his friends held yet another benefit, this time a concert at Tweddle Hall. In 1870, Captain John Cooke was appointed a messenger in the Adjutant General’s Office, and he held that position until his death in December 1875. Cooke’s funeral was held at St. Paul’s church on Lancaster Street, the service read by our rector, J. Livingston Reese. The building was crowded with his many friends, and particularly the musical and military groups with which he had been associated. A contemporary newspaper praises the music, both choral and instrumental, which would have been led by our organist and choirmaster, Edward Savage. A final memorial was made to the old veteran the next year, with the publication of “Captain Johnny Cooke’s Grand March,” by James Haydn Waud, organist at Albany’s Cathedral of the Immaculate Conception. It is dedicated “to the surviving members of the Albany Brass Band.” The cover displays the only likeness of Captain Cooke that we have been able to find. It shows him late in life, heavily bearded, with his crippled right arm supported in a sling. This entry was posted in General Albany History, Lancaster Street Building, Music on November 10, 2017 by Paul Nance.